Opening times Mon–Fri 3pm–2am; Sat & Sun noon–2am. Seasonal times Open til 5am during Nov & Dec.
Karaoke Box’s latest offering is located on Maddox Street in Mayfair, a few minutes walk from Oxford Circus tube station. The sparkling venue boasts a cocktail bar and lounge serving trademark contemporary cocktails to our seven private karaoke rooms. Each room is uniquely themed to suit ones personality or mood. 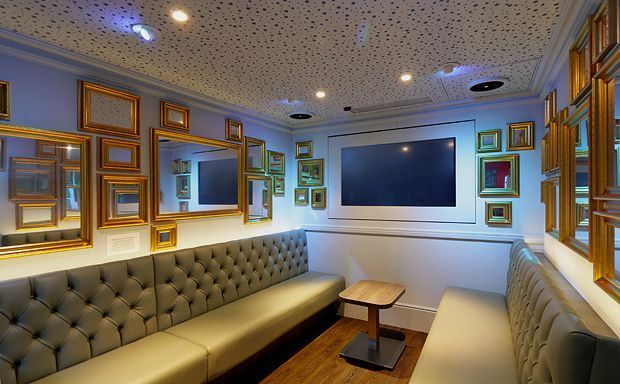 For those looking to go a little crazy, then why not try our Lady Gaga inspired ‘Padded Cell’ room? Or for those after a more civilized sing-song then give Elvis’s ‘Gold Room’ a twirl. Being the tech savvy bunch that we are, each room is kitted out with a state of the art touch-screen karaoke system, professional studio sound quality (results may vary), wireless microphones and songs available in English, Japanese and Arabic. Volume control and room service is offered at the push of a button on our iPad interfaces, so can sing til your heart’s content without having to move a muscle going to the bar for drinks or snacks.